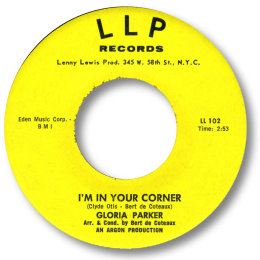 New Yorker Gloria Parker’s first 45 I’m In Your Corner showed her to have a big big voice. You could tell she was no shrinking violet at a time when some very twee girlie music was being cut in the city. Arrangers and producers Clyde Otis and Bert de Coteaux set her in a splendid chugging beat with a well judged horn section – love that baritone sax! But her next 45 for Lenny Lewis’ label was even better. If You’ve Ever Loved Someone is as good a deep soul side as ever came out of the Big Apple. Otis and de Coteaux created a series of mini climaxes from the excellent arpeggio led rhythm and horn sections at the chorus line to match Gloria’s impassioned wailing. Simply stunning. Power personified. The guitarist is superb too – bet its Eric Gale. What appears to be her final 45 for Samar was a bit of a disappointment. “I’m Headed In The Right Direction” was very much in the mould of her previous efforts but the song simply wasn’t as good. 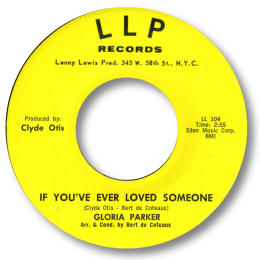 UPDATE Mike Gray has reminded me that Jean Wells also used the same backing tracks as Gloria Parker for her versions of "If You've Ever Loved Someone" / "Hello Baby Goodbye Too" on Eastern 610.